Grand Park may have this week’s starring role but another downtown park is breaking ground tomorrow, Aug. 2. 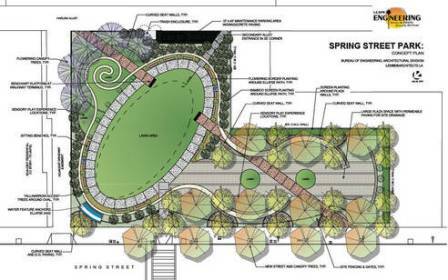 Spring Street Park, between 4th and 5th streets, is set to enter its construction phase and expected to open in spring/summer 2013. And it’s located on land once reserved for a parking structure. Studies have shown that fewer parking spaces translate to more hunger for public transit. Now if we could just replace a few more lots. Alameda Corridor — the 20-mile rail expressway connecting the Ports of Los Angeles and Long Beach with the Union Pacific and Burlington Northern rail yard gateway to the rest of the country — has been a resounding success for truck and car mobility and air quality. And it has allowed the Ports to accommodate significant growth over the last ten years. However, there’s a little matter of significant debt and what to do about it. A short guide book tour of the Orange Line Extension separates out minor, but in several cases intriguing, points of interest that might otherwise go unnoticed by travelers passing by on the bus. Last but not least, check out this segment in the on-going NPR Cities Project, which has been asking listeners to talk about the hearts of their cities. You might recognize this quick soundbite as one of our own. In its own way, it’s music to our ears.